How would you like to save $1000 on that new Toyota vehicle you have been eyeing in the Cleveland, OH area? Here at Motorcars Toyota, recent and upcoming college graduates can save money, thanks to Toyota's College Graduate Rebate Program! Wherever life may take you following graduation, let a new Toyota get you there in style -- and at an affordable price! Here at Motorcars Toyota, we are always looking for ways to save our customers money. With Toyota's College Graduate Rebate Program, recent or upcoming college grads can save $1000 on the purchase of eligible new Toyota cars, SUVs and pickups at our dealership in Cleveland. We invite local college graduates shopping for a new car near Cleveland Heights and Euclid, OH to contact the sales team at Motorcars Toyota for more details on qualifying new Toyota purchases that can help you save $1000 on your new car purchase! Students graduating from college in the next six months or who have graduated in the past two years may be eligible for Toyota's College Graduate Rebate Program*. You may also qualify if you are enrolled in or have graduated from a qualifying graduate program; have completed a two-year post-secondary automotive program accredited by the NATEF or have completed an electrician certification program through NJATC and the IBEW. *College Graduate Finance Program is valid on the lease or finance (including preferred option) of all new and unlicensed Toyota models or on Toyota Certified Used Vehicles (TCUVs) or Scion Certified Pre-Owned Vehicles. College Graduate Rebate is only available on new untitled Toyota Camry, Camry Hybrid, C-HR, Corolla, Corolla iM, Prius (excl. Prius Prime), Prius c, Prius v, RAV4, RAV4 Hybrid, Tacoma, Yaris, Yaris iA, 86, and all new Scion vehicles (TCUVs and Scion Certified Pre-Owned vehicles are not eligible for the Rebate Program). 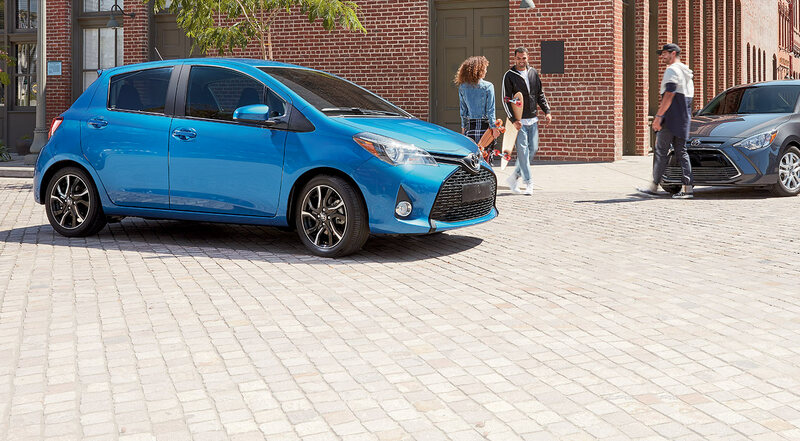 The College Graduate Rebate Program and College Graduate Finance Program are available upon credit approval from and execution of a finance or lease contract through a participating Toyota dealer and Toyota Financial Services (TFS). Not all applicants will qualify. To qualify for the College Graduate Rebate Program and College Graduate Finance Program, customers must be currently enrolled in a graduate degree program from an Eligible School (as defined below), or enrolled in or be a graduate from an Eligible School (as defined below) and provide proof of graduation (showing an upcoming graduation within six months OR a recent graduation within two years from the date of signing your vehicle lease or finance contract) from one of the following Eligible Schools located in the 50 United States, Puerto Rico, or U.S. Virgin Islands: (a) an accredited four-year college, university or registered nursing program; OR (b) an accredited two-year college associate degree or an undergraduate academic degree as awarded by community colleges, junior colleges, technical colleges and universities; OR (c) an accredited two-year trade or vocational school; OR (d) an accredited graduate school. In all cases, the student will have two years from receipt of their degree to take advantage of the program. Must provide proof of qualification and any one of the following documents will be accepted: (a) copy of diploma; OR (b) letter from the college/university/trade school registrar’s office stating graduation date and type of degree or certification earned; OR (c) copy of the final transcript confirming graduation date and type of degree earned; OR (d) copy of current transcript (or letter from college/university registrar’s office) confirming current enrollment in a graduate degree program. Eligible customers must also meet credit approval requirements and furnish proof of present employment or proof of future employment (which will begin within 120 days of credit approval) when submitting credit application. Rebate offered by Toyota Motor Sales, U.S.A., Inc. Rebate will be applied on TFS lease agreements toward the amount due at lease signing or delivery or capitalized cost reduction or the down payment on TFS finance contracts. Limit one rebate per lease or finance transaction. College Graduate Rebate Program is not compatible with the Toyota Military Rebate Program or iFi Program. College Graduate Programs are subject to change or termination at any time. Some restrictions apply. Programs are not available in AL, FL, GA, NC, and SC. Rebate terms may be more generous in your local area. Ask your participating dealer about the College Graduate Rebate terms in your area. Competitive APRs and lease terms are available on eligible finance contracts with terms up to specified number of months for retail and lease and preferred option financing on new vehicles. See dealer for details. Must pay sales tax. Void where prohibited by law. Rebate not redeemable for cash. Deal offer expires 2/4/19. © 2017 Toyota Financial Services. All rights reserved. Toyota Financial Services is a service mark of Toyota Motor Credit Corporation (TMCC). TMCC is the authorized attorney-in-fact and servicer for Toyota Lease Trust.